Ararat, Mount (Armenian Masis; Turkish Buyuk or Agri Dagi; Persian Koh-i-nuh), mountain in extreme eastern Turkey, near the border with Armenia and Iran. Except on the northwest, where a spur nearly 2,200 m (7,000 ft) high merges with a long ridge, the mountain is completely isolated, being surrounded on all other sides by elevated plains ranging from 800 to 1,400 m (2,500 to 4,500 ft) above sea level. From an elevation of 2,700 m (8,800 ft) Mount Ararat rises in two peaks, known as Great Ararat (5,137 m/16,954 ft) and Little Ararat (3,914 m/12,840 ft). Above the 4,300-m (14,000-ft) level, Great Ararat is perpetually covered with snow. Vegetation, consisting for the most part of grasses, is chiefly confined to the area between 1,500 and 3,350 m (5,000 and 11,000 ft). According to the Old Testament (see Genesis 8:4), Noah's ark landed on the mountains of Ararat after the deluge. 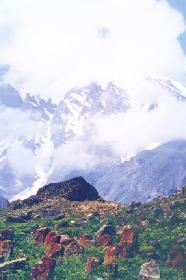 Great Ararat was first climbed in modern times in 1829. On July 2, 1840, great masses of the mountain were torn loose by a violent earthquake. The resulting avalanche buried a village and a convent on its lower slopes. An American expedition ascended Mount Ararat in the summer of 1949 in an unsuccessful search for evidence of the existence of Noah's ark. Recent expeditions have reported finding timbers that members believe to have come from the ark. This ancient lost Armenian village was discovered by the Armenian expedition and is discussed in detail in Ararat Beckons! 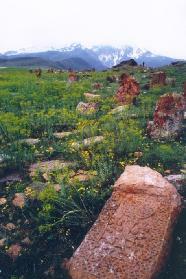 The only remains of the ancient Armenian Monastery Aghuri. The village was located by the Armenian expedition and it is discussed in Ararat Beckons! Is this really Noahs Ark?